Alfa Romeo 156 first series, available in sedan and sport wagon version. 1.9 JTD diesel engine valve cover vooa used as used in Alfa Romeo 156, Fiat Multipla I and Lancia Lybra.The valve cover is ultrasonically cleaned and ..
Used part. Short straight air hose for mounting to the MAF sensor for Alfa Romeo 1.9 JTD engines. Might also be applicable to other engine types on th.. Plastic pipe for air direction air filter supply House for Alfa Romeo 156 with 1.9 JTD engine. Submitted by a 156 sedan by year 1999. The curve does n..
Airbag computer for the frontal impact for Alfa Romeo 156. This unit includes the sensor and the control of the airbags in a frontal collision. The un..
AIRCO pipe for Alfa Romeo 156. Submitted by a sedan of construction year 1999 with 1.9 JTD engine. The main is leak-free.Inscriptions on the main:Murr.. Brake light switch for installation above the crank arm of Alfa Romeo 156. Submitted by 156 sedan built in 1999 with a 1.9 JTD turbo-diesel engine. Th..
Used bracket for mounting the intake manifold at the level of the refrigerant pipes to the front of the engine. Applicable to the 1.9 JTD engines deli..
Schakelaar voor de inschakeling van achteruitrijverlichting voor Alfa Romeo 156 voorzien van 1.9 JTD dieselmotor. De schakelaar registreerd het inscha.. Lock mechanism for mounting in rear cover for Alfa Romeo 156 sedan first series. The lock is submitted by an Alfa 156 sedan by year built 1999 and is ..
Dryer for the air conditioning system applicable to Alfa Romeo 156 and 147. Submitted by a 156 sedan by year 1999. 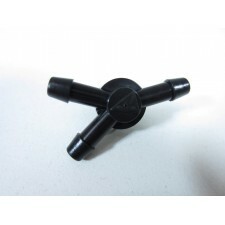 The unit is a product by Magneti Ma..
New unused article.adapter for car stereo to the antenna cable from ISO to DIN. On most Lancia's is the original antenna cable equipped with a DIN to ..
Antenna amplifier for Alfa Romeo 156. Submitted by a sedan by year built 1998 and working well. This unit is delivered in combination with the shorter..
Antenna amplifier for Alfa Romeo 156. Submitted by a sedan by year built 1999 and working well. This unit comes from a car with no visible antenna on ..
Backflow cover with split for the leadership of the washer fluid for several types of Fiat Lancia and Alfa Romeo. Used on the Fiat Stilo, Alfa 147, 15.. Battery holder for an Alfa Romeo 166. The unit is in very good condition, has never been in contact with battery acid, and the original coating is sti..